_caldavs._tcp IN SRV 0 1 443 owncloud.feildel.fr. _carddavs._tcp IN SRV 0 1 443 owncloud.feildel.fr. My owncloud installation works with well knowns url. I don’t know why it doesn’t work, can someone help me ? Login with email uses the whole email address as login, not only the local-user part (the part before the “@”). 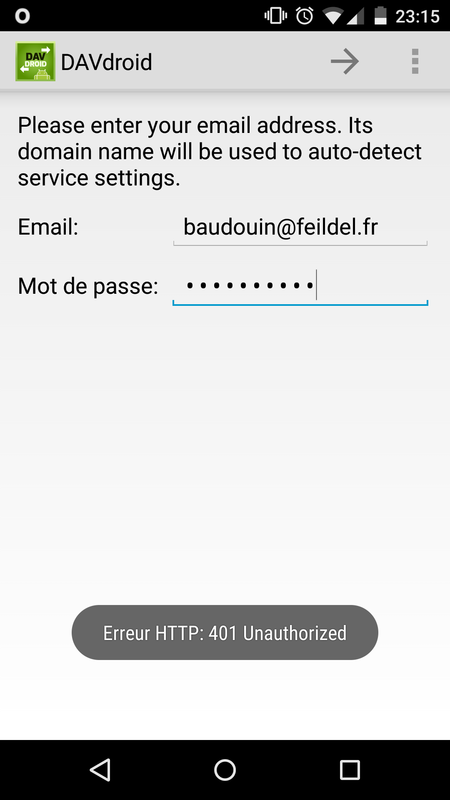 Can you use your email address as login with your OwnCloud installation? No I just use the local-user part. Then this is the reason. According to the standard, CalDAV clients SHOULD repeat the detection with the local-user part if the email address results in 401, but it’s not implemented in DAVdroid. Please use the login with URL method. The SRV records are still evaluated, i.e. you only have to enter your base domain (feidel.fr) in the URL field. OK, thanks for your help. Perhaps I could make a pull-request to add the functionality ? Perhaps I could make a pull-request to add the functionality ? Of course, high-quality pull requests are welcome. However, I think the implementation is not trivial. I guess getInitialContextURL in DavResourceFinder would have to return a data object instead of a String with more information to achieve this.